Larry spent his childhood in Winston County MS and graduated from Mississippi State with a BS in Mechanical Engineering. As a recent graduate, he started out in the shipbuilding industry in Jackson County MS. The last 40+ years were spent in the oil & gas industry traveling to many states and abroad. All those years he spent in Hinds County and Madison County MS with his wife Diane. Larry and Diane have one son, Baxter. Larry is a member of First Baptist Church of Madison and lives in the city of Madison. Larry grew up deer and squirrel hunting in Noxubee Wildlife Refuge, and fishing in Noxapater Creek, Bluff Lake, Grenada Lake, & Ross Barnett Reservoir. Larry owned a weekend/fishing camp on Cane Creek for over 20 years. 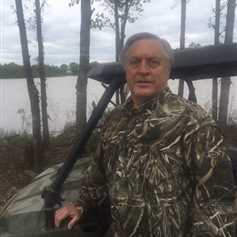 More recently Larry hunted deer in Clubs/Camps in Rankin and Leake Counties. In 2013, he purchased almost 200 acres in Carroll County near McCarley MS and built a weekend/vacation home on the acreage and on Lake Barrentine. The land while a Certified Tree Farm, is populated with deer, turkey, quail, limited ducks, coyote, squirrels, & rabbits and the lake provides fish and frogs. Duck hunting is usually reserved for Sunflower County. The Carroll County land provides Larry the opportunity to drive his John Deere tractor keeping trails clear and planting food plots. Larry has the knowledge to assist you in your land needs whether you want to sell or buy recreational, hunting, investment, farming, or commercial land.